The Battery Sleeve by 3M� DBI-SALA� allows cordless drills and similar battery operated devices to be safely tethered when used at height. A neoprene sleeve with an adjustable strap conforms to the shape and size of virtually any drill battery, which can then be secured using the included cinch. Unique sleeve design conforms to the size of virtually any drill battery. Extremely fast and efficient installation allowing the drill to be tethered off while being used at height. 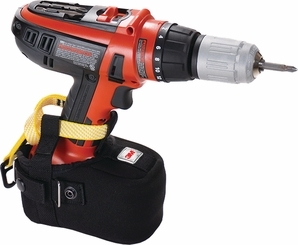 Designed to be used with most drill batteries or other battery powered hand tools.